Ask the doctor: Can strength training exercises help with COPD? 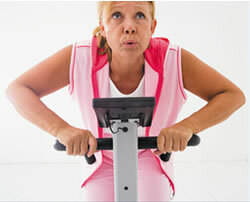 Q. I am a 68-year-old overweight woman with COPD who has recently started exercising regularly. I have been riding a stationary bike for about 10 minutes, six days a week, and I just can't seem to go longer without getting short of breath. My doctor suggested that I stop using the bike and start weight training. How will that help me get in shape and lose weight? A. Weight training is a great suggestion! Getting in shape involves working both your heart (cardiovascular exercise) and your muscles (strength training). One of the important benefits of strength training is that it makes your muscles more efficient at extracting oxygen from your blood. Weight training also builds muscle.